Nuts Online is a company that I have been wanting to review for a long time. 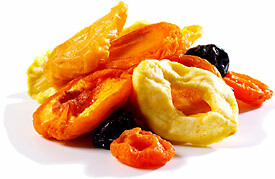 Finally, I got the opportunity to review this column dried fruit platter. It includes my favorite kinds of dried fruit including dried peaches, pears, and plums. It also has coconut dates on it. The fruit is so delicious! I have never tried dried plums besides prunes before. It really is different. The dried plum is tart and yummy. This tray retails for $22.99. I would definitely recommend this fruit tray. The company also offers nuts, chocolates, coffee, tea, and other great snacks. They have many different options at affordable prices. Check out Nuts Online today! 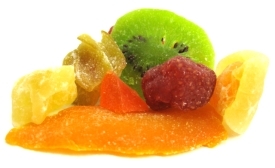 The giveaway will be for one pound of dried fruit of the winner's choice from Nuts Online. The giveaway is open until Midnight on Monday January 31st. Winner will be chosen on Tuesday February 1st using Random.org. **Please note this giveaway is open to US and Canada residents only. Visit the Nuts Online website and let me know what kind of dried fruit that you would choose if you won this giveaway. I would pick the dried strawberries, I love strawberries. #1 Like on Facebook as Linda Henderson. #2 Like on Facebook as Linda Henderson. #3 Like on Facebook as Linda Henderson. Follow on GFC as seriousreader. Oh, they have a lot of good ones! It's a toss-up between the strawberries and peaches. I'd probably go with the strawberries tho! we would pick dried blueberried for sure, my daughter would love them so much! I would choose the dark chocolate covered espresso beans - yum! I'd love to try the Berry Mix. Thanks for the review and giveaway! 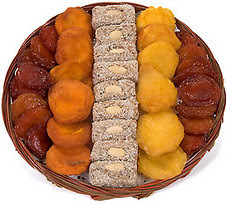 I would choose the Lucuma dried fruit if I won. I'd pick the goji berries - I've always wanted to try them! I would choose dried organic persimmons! I entered the Swilt giveaway. I would love to try to the dried strawberries! I LOVE raw cashews, so I'd get some organic raw cashews! I also entered the towel giveaway. I'd pick the juice infused strawberries. Yum! I entered the towel giveaway!